​Two companies operate bus services in Sorrento, EAVBUS and SITA sud. 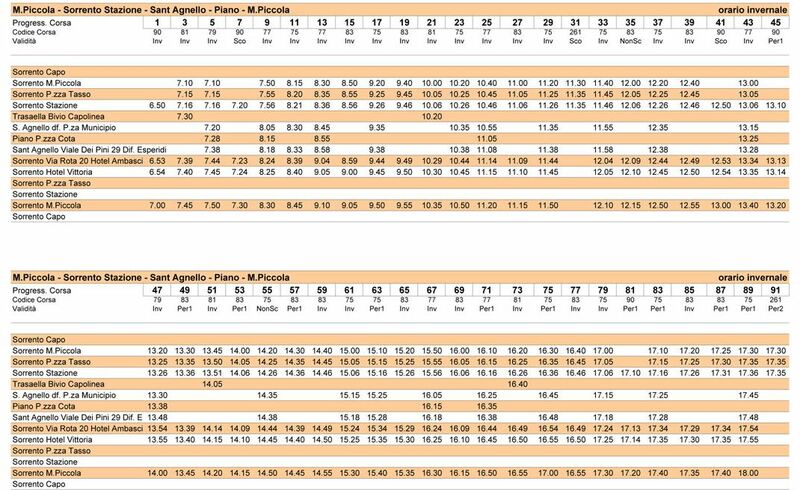 Here you'll find all the timetables, routes, 2018 prices buying tickets and advice about travelling to and from Sorrento by bus. Certainly the most cost-effective way to travel around the Sorrento Peninsula is by bus and you'll be able reach most of the destinations you may want to visit during your stay. Make sure you buy your tickets before boarding the bus. You can buy tickets from newsstands, tobacconists (tabacchi), some bars and hotels. Also remember to stamp the ticket in the machine just after getting on the bus and alert the driver if it does not work. Failure to produce a valid, stamped ticket can result in a heavy fine. You can easily spot the red buses operated by EAVBUS that circulate around the town of Sorrento (Line B and D) but also connect with nearby towns and beaches on the Sorrento Peninsula (lines A and C). Several routes cover the areaa between Meta and Sorrento, from Marina Piccola to the train station, to Sant'Agnello and to Piano di Sorrento. 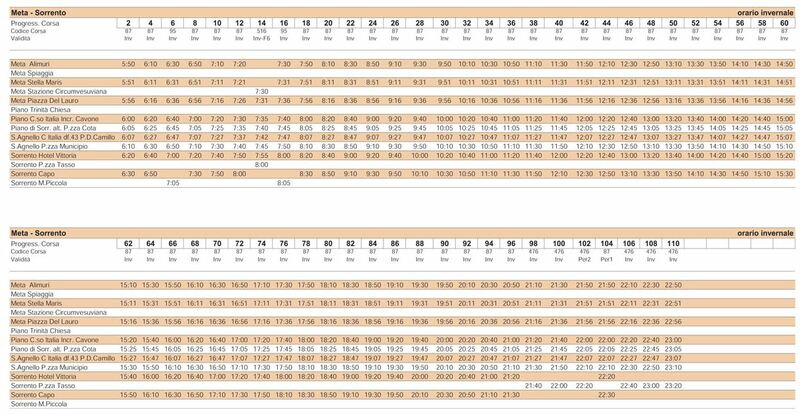 Please note, whilst we endeavour to give accurate information, timetables are subject to change from these two companies. Unico Costiera Sita prices are the same for all of the Amalfi Coast with its 20 comuni (boroughs/districts): Agerola, Amalfi, Atrani, Cetara, Conca dei Marini, Furore, Maiori, Massa Lubrense, Meta, Minori, Positano, Piano di Sorrento, Praiano, Ravello, Salerno, Sant’Agnello, Scala, Sorrento, Tramonti and Vietri sul Mare.